Ghana’s Michael Essien could return against Germany on Saturday. The AC Milan midfielder returned to training on Thursday, after missing out on a Wednesday session. Essien had injured his toe during his side’s 2-1 lost to the United States last week. Coach Kwesi Appiah was questioned for his decision to start with Essien and forward Kevin-Prince Boateng on the bench against the USA. With tough games against Germany and Portugal, Essien’s recovery will come as a much needed boost for Ghana, who needs good results to get into the tournament’s round of 16. 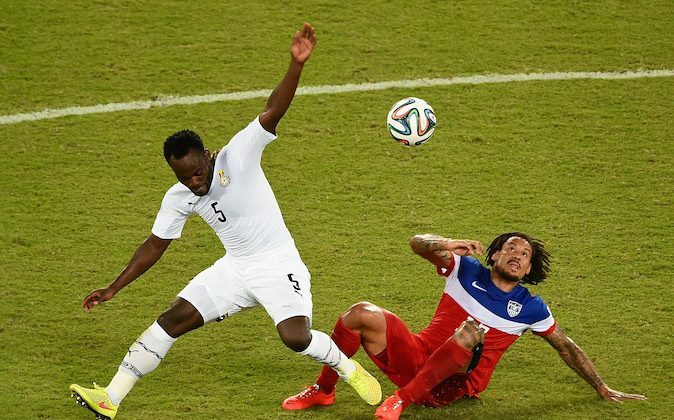 Here is an Associated Press article on the Ghana team. FORTALEZA, Brazil (AP) — After losing the first match, two subjects are off limits for Ghana: An early exit from the World Cup, and family. Ghana striker Kevin Prince Boateng could play against his half-brother Jerome on Saturday, when the ambitious Africans take on Group G favorite Germany in Fortaleza. The Boatengs already met in their last World Cup four years ago when Germany won 1-0, and have played against each other in the Bundesliga. The 24-year-old winger plays with his younger brother Jordan in the Ghana squad, and their father was football great Abedi Pele, who was once a national teammate of the current coach James Appiah. The coach and Andre Ayew insisted family had little significance in the game against Germany, which started the tournament with a 4-0 thrashing of Portugal. Ghana, playing in its third consecutive World Cup, had started with the goal of reaching the semifinals, but its 2-1 opening loss to the United States and a string of injuries have left the Black Stars fighting to avoid an early group exit. Belgium-based defender Daniel Opare is doubtful, and AC Milan’s Michael Essien is recovering from a toe injury. The Boateng brothers were kept away from reporters at training sessions by Germany and Ghana at Fortaleza’s Castelao Stadium. When asked about the potential matchup, German coach Joachim Loew was eager to move on to another subject.